President Donald Trump said on Tuesday that before he makes a statement on an important matter he likes to "know the facts" and "be correct." On Thursday, he responded to the Barcelona terror attack by spreading a debunked rumor. 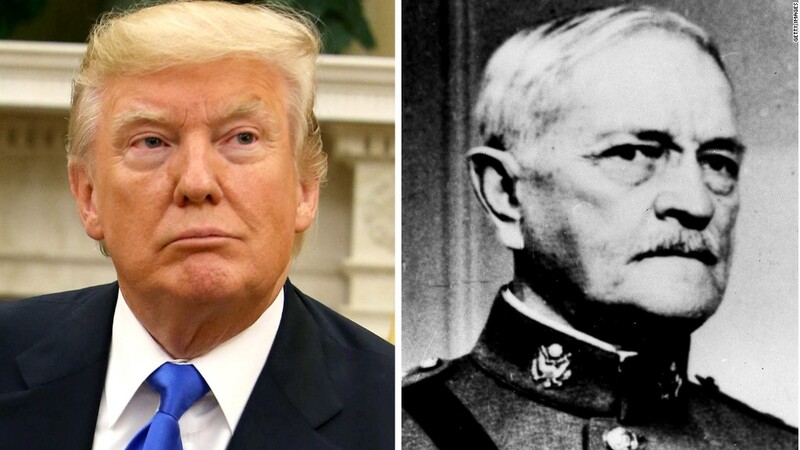 "Study what General Pershing of the United States did to terrorists when caught," Trump urged his 36.1 million Twitter followers. "There was no more Radical Islamic Terror for 35 years!" Trump was likely referring to a supposed practice of shooting Muslims with bullets dipped in pig's blood or burying them with the bodies of pigs. For some time, there have been rumors that claim Gen. John J. Pershing employed such tactics following the Philippine-American War in order to deter insurgents. Trump previously referred to this during a February 2016 rally. In the story Trump told at that time, Pershing's forces captured 50 Muslim prisoners. Pershing then, Trump said, "took 50 bullets, and he dipped them in pigs' blood. And he had his men load his rifles, and he lined up the 50 people, and they shot 49 of those people. And the 50th person, he said, 'You go back to your people, and you tell them what happened.' And for 25 years, there wasn't a problem." There is no evidence to support this claim. Snopes, a website that fact-checks Internet rumors, declared it to be false. Politifact, another fact-checking website, gave it a "Pants on Fire" rating. In Pershing's memoir, "My Life Before the World War, 1860-1917," he wrote of another commanding officer in the Philippines who had at least once buried Muslims "in the same grave as a dead pig." But as Politifact noted, this anecdote does not support Trump's claim -- either the specific story he told, or the idea that it was effective at deterring future attacks. "There is no evidence that Pershing himself committed these acts, there is nothing said about the use of 50 bullets dipped in pig's blood, and most important, there is no evidence to support Trump's claim that this tactic was effective in stopping violence -- or that it would provide a useful policy today," Politifact said in its story debunking the claim. Moreover, the idea that all Muslims believe that if they are shot with pigs' blood they would be sent to hell, the foundation of the supposed tactic, is incorrect. Islam forbids its followers from consuming pork, but "there is no penalty for coming into contact with pork given by the Quran," Shannon Dunn, an assistant professor of religious studies at Gonzaga University, told HuffPost. A spokesperson for the White House did not immediately respond to a request for comment. Thursday's attack in Barcelona left at least 13 dead and 80 injured. Authorities have arrested two people. ISIS' media wing, Amaq, issued a statement through social media calling the perpetrators of the attack "soldiers of the Islamic State."